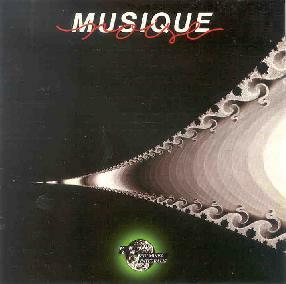 Musique Noise - "Fulmines Integralis"
Musique Noise are a French ensemble whose music is influenced in equal parts by Magma inspired Zheul, jazz fusion and progressive rock. Fulmines Integralis is a reissue of the bands 1988 release on Musea entitled Fulmines Regularis, plus 4 tracks recorded in 1992 for a never released second album. Much of the bands music has a cool jazz sound, but also a more progressive edge that reminded me of Soft Machine, Gong, and perhaps even In The Wake Of Poseiden era King Crimson. However, the near operatic chanting vocals of Isabelle Bruston, Cornelia Schmid and Jean-Philippe Gallet inject a power and majesty into the music that reveals the bands Magma influences, and indeed there are several tracks that see the band traveling more overtly into Magma territory. The intensity level is high and the music exciting as Musique Noise keep the listener on seats edge with their continual shifts through multiple themes. The band alternates between fiery and calmer sections, though even the slower sections function as fervent buildups. "L'etroit Huit" is a standout track being a killer mixture of Magma and Gong, perhaps even some Nektar circa Recycled but with a heavier progressive rock keyboard presence. "Ragnarok" is an excellent piece of prog-fusion, and dig that electric piano! Overall, Musique Noise are a band that excel at fire, passion and well thought out complexity. Recommended to fans of all things Zheul who aren't looking for a mere clone of Magma.